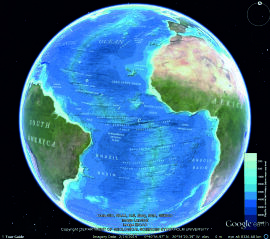 The General Bathymetric Chart of the Oceans (GEBCO) World Map is a shaded relief map of the global ocean floor, created using GEBCO data. The third release of the map is now available to download as PDF and GeoTIFF (a version of TIFF that has georeferencing information embedded in it). The new map uses bathymetry data from the latest version of GEBCO's global bathymetric grid, the GEBCO_08 Grid (version 20100927), which has a 30 arc-second resolution. It also includes the names of sea floor features from the IHO-IOC GEBCO Gazetteer of Undersea Feature Names. As with previous versions of the map, it uses NASA Blue Marble imagery for the land and the coastline is taken from the World Vector Shoreline dataset. The map is featured in the Google Maps Gallery and can be used in Google Earth.